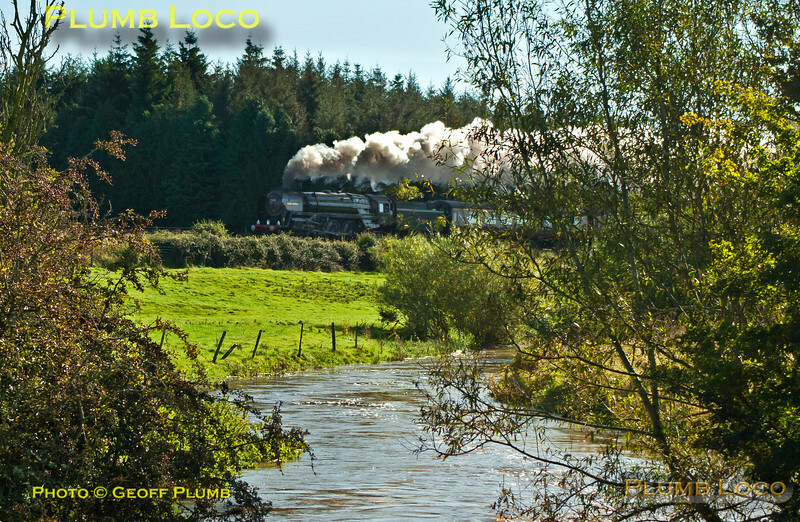 The River Evenlode is in full spate in one direction while "Britannia" 4-6-2 No. 70013 "Oliver Cromwell" is in full cry in the other direction. It is working hard at the head of 1Z71, "The Cotswold Venturer", 08:05 from Paddington to Worcester via Evesham and return via Sapperton on Saturday 6th October 2012. In glorious, but awkwardly angled, sunlight the train is seen near Lyneham running on time at 11:06. Digital Image No. GMPI12508-2.